So email’s becoming obsolete, huh? Facebook COO Sheryl Sandberg said as much last June. And of course, everyone knows younger users don’t even use email anymore. (Let’s just ignore the fact that you can’t open a Facebook account without an email address). Now, Facebook’s set to announce Project Titan on Monday, which is almost universally expected to be an unveiling of Facebook’s “Gmail killer” email service. Once upon a time, NPR was an acronym for National Public Radio. That was then. Now, the company refers to itself as “a thriving media organization at the forefront of digital innovation.” The formerly pureplay broadcast organization is now as likely to distribute its content via live streams, iPad apps and social media as over the airwaves. We caught up with Lori Kaplan, NPR’s director of audience insight and research, to discuss how NPR is measuring and acting on data from increasingly disparate sources, and to learn how non-profit metrics might differ from those used by traditional media organizations. Google Instant Previews: will it change site design? Today Google launched Instant Previews, a form of visual search that enables searches to preview a page before clicking through from the SERP. Once enabled, a magnifying glass icon appears next to the search result. Click it with your mouse and a preview of the relevant page appears on the right side of the SERP. You can give it a shot by clicking through via this page. Google Instant Previews is yet another cool and useful feature for searchers, to be sure. What will its impact be for marketers, web designers, e-commerce providers and others who rely on SEO for traffic and revenue? At the PRSA’s massive annual conference this week, thousands of communications professionals gathered in Washington, DC to take a long, hard look at trends in public relations. What’s on their radar? Social media, of course. Several questions around how PR can dovetail with social media arose repeatedly. Herewith, the seven top FAQs PR professionals are asking about social media – along with the answers. IAB: Best year ever for digital advertising? Will 2010 be the best year ever for interactive advertising? If the numbers released today by the IAB in conjunction with PwC for he first half of the year are any indication, this year is one for the record books. For the first half of the year, US internet ad revenues totalled $12.1B, the best recorded number ever for the period, reflecting 11.3% growth over the same period last year. Q2 was even rosier when broken out. 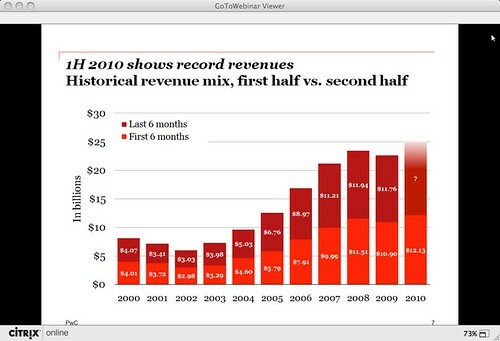 Revenues of $6.2B reflect the second-highest quarterly results ever, and a near 14% increase over Q2 2009. 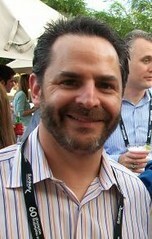 Scott Silverman is a familiar name and face in e-commerce, having served as executive director of Shop.org for over a decade. During his tenure, his focus was developing digital ways to sell tangible things. In his new role as co-founder and VP Marketing of Ifeelgoods.com, Silverman’s focus will be on a newer trend in e-commerce: virtual goods, including digital rewards and incentives. Nothing to sneeze at, given it’s estimated some $1.6 billion will be spent by consumers this year on social games such as FarmVille and Mafia Wars. So we caught up with Silverman to discuss his new company – and a just-announced deal with Facebook. What’s more annoying and contextually irrelevant than the text in a captcha – those squiggly, gibberishy words and phrases you have to type to authenticate an online log-in? A start-up, Solve Media, thinks it’s found a solution: replace gobbeldygook captcha text with an ad. Adam Broitman will deliver one of the two keynotes at Econsultancy’s upcoming Peer Summit in New York. We asked for a sneak peek at what he’ll address in his talk, entitled “Beyond Digital Innovation: The Sedative Nature of Counting Screens.” Following, his views on Internet Everywhere, why it’s never going to be the Year of Mobile and the blurring lines between technology and humanity. The Web is getting a makeover. HTML5, the not-yet-ratified update of digital media’s standard language, is poised to become a game-changer for publishing, advertising, marketing, video, mobile platforms and search. The industry big guns: Google, Microsoft, Mozilla and Apple, are all over the new format. While it may not yet be the moment to convert to this yet-embryonic platform, it certainly is time for anyone doing business on the Web to get up to speed on what HTML5 is, and why it may soon be changing digital media, commerce, publishing and advertising. How do businesspeople interact with online ads? Women click on them, men act on them, and both genders do so at vastly differing times of the day (and night). Online ad targeting firm Bizo undertook a survey of over 80 million business professionals between January and July of this year. Go green, get rewarded. In a nutshell, that’s RecycleBank’s business model and value proposition. The company teams with municipalities to add chips to recycling bins to monitor activity. Consumers receive points, redeemable for goods and services, from companies ranging from Coca-Cola to Yoplait to eBay. Everyone wins: localities have less landfill, consumers are rewarded for good behavior, and brands can bask in a do-gooder, green glow. The company recently expanded to the UK, and has also gone beyond its recycling roots into other green activities. We caught up with CMO Ian Yolles, whose own green cred is impeccable. He joined the company following stints with Outward Bound, Nike, Patagonia, and The Body Shop. Yummy Interactive’s VP Software Distribution, Christopher Hennebery wants to make DRM as painless as possible in order to stop erecting unnecessary barriers to online conversion.